Last year summer ended up being a hard season for me. So this year I've been trying to take the planning more seriously. I had some inspiration no too long ago that I needed to make this summer a summer to remember for my kids. This summer is different in a lot of ways-- I'm not pregnant, my two-year-old "baby" only takes one, consistent nap, and my three other kids are very self sufficient (all of these are so different from past summers we've had!). So this is the year I'll finally have enough energy to do something memorable! I've loaded our calendar and created a schedule. I've tried to combat a lot of the things that went wrong last year, and the things I wanted to change. -I've signed my kids up for a few half day camps and lessons. I learned last year that we do need some time apart, but I also know that full day camps are overkill. Power of Moms has an awesome Do-It-Yourself summer camp ideas, but I am so not structured enough (and I enjoy being more spontaneous by nature) that I know I wouldn't stick with it. I do better when structure is forced upon me, like having to get somewhere at a certain time. This year we did swim lessons at 11am. I love it! It gives us enough time to get chores done in the morning, no rush, and then we have somewhere to go, and by the time we're back it's lunchtime. -I made a summer bucket list. Afternoons have to be slow around here because Frank always has a 2-hour-ish nap in the afternoon, so we have to be home. 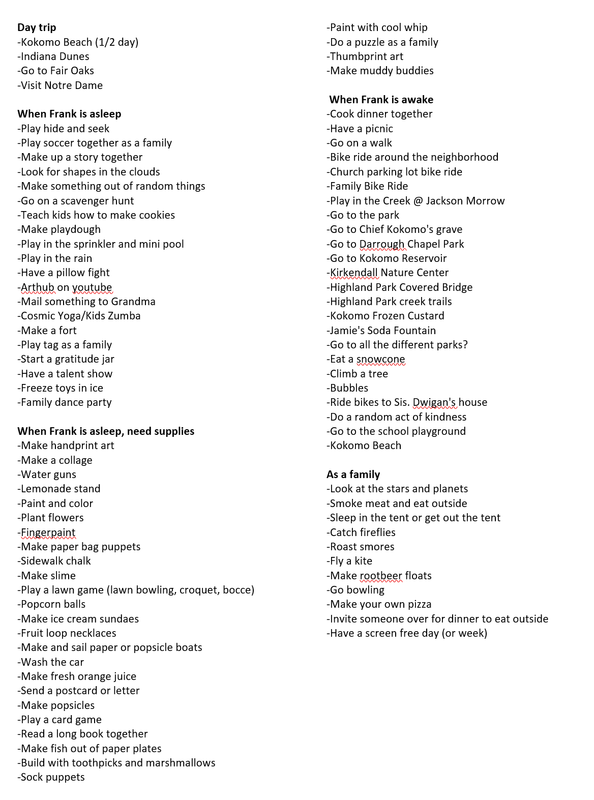 I thought a bucket list would be good for thinking of things I can do with the kids while we are stuck at home, and also quick things we can do once he wakes up, but before dinner. I want to make sure summer is a time that we build our relationships with each other. I loved this thought from a reader at Mel's Kitchen Cafe. Would love to hear how you are hoping to build relationships with your family this summer! Or ideas for our summer bucket list! This blog is a place where I share what I am learning and experiencing. I have a deep love for Jesus Christ and try to view my life in a way that would be pleasing to Him. As such, I try to view my roles as mother, wife, sister, and friend through a lens of faith and looking for the good. While my offerings are meager, I have felt called to be a voice of faithfulness and positivity in the world through this blog. I find joy in sharing, it's part of who I am, and this blog is where I do that.